"Mythbusters" co-hosts Adam Savage (left) and Jamie Hyneman (right). In 2005,Jamie Hyneman and Adam Savage, special effects experts better known by thetitle of their popular Discovery Channel series, "MythBusters", wereasked during an interview about the myth they would most like to test providedan unlimited budget. "Jamie and I have done the research, and figured that the only way to endthe debate about the 'myth' of the Apollo moon landing is to go there,"Savage replied to Slashdot, a technology news website, about thebelief held by some that the United States faked thelunar landings. Three years later, the Mythbusters are ready to share the results of their'trip' as they devote their next show, airing on Wednesday, to the moon landinghoax claims. "We built a hybrid rocket that was fueled by poo and nitrous oxide —thought we had enough Teflon tape on the seals but the stink got throughanyway. Too bad that the footage got lost in transit to the editors,"Hyneman told collectSPACE.com,explaining that their limited budget would not cover the cost of regular rocketfuel. "Dude, I sooo wished we could have gone there," Savage admitted. So, with their feet firmly planted on the Earth (at least for most of the time,but more on that later), Hyneman and Savage, along with fellow Mythbusters ToryBelleci, Kari Byron and Grant Imahara, set out to use science to 'bust' orconfirm the truth behind the hoaxers' claims. Hoaxbelievers have had 40 years to devise reasons why the Apollomoon landings must have been filmed in an Earth-based studio. As specialeffects experts, Hyneman felt they were well suited for the subject. First however, they needed to choose which parts of the myth to test. "We looked at the ones that for some reason or other, seemed mostprevalent," Savage explained in an e-mail interview. "We took the low hanging fruit," Hyneman added. "The key ideawas that the footage that proved we were there was a special effect. Adam and Iare experienced effects artists, so it was natural for us to dig into it." "We wanted to tackle the ones that actually take some experimentation toprove," Savage said. To narrow the field however, the Mythbusters sought the assistance of someonevery familiar with debunking the moon hoax myth, or they would have if he hadnot come calling first. "I was actually first involved with the Mythbusters early on, when I wascontacted by one of their producers asking if I had any astronomical myths forthem to bust," shared Dr. Phil Plait, a.k.a. "TheBad Astronomer", in an interview with collectSPACE.com. Anastronomer who worked with the Hubble Telescope, Plait created a website, BadAstronomy, aimed at dispelling astronomy and science based myths, includingthe moon hoax, which expanded into books and his recent appointment aspresident of the James Randi Educational Foundation. "I made some suggestions but sadly they didn't use any of them,? Plaitsaid. ?I guess most of them don't make very good TV." That early interaction, which was followed by meeting the Mythbusters atconferences, led to Plait establishing a relationship with the show. So he wassurprised when a fellow astronomer contacted him about the Mythbustersinvestigating the moon hoax. "I hadn't heard anything about [this show] so I fired off an e-mail toAdam Savage and said, 'What gives?' and he e-mailed me back and said,'Oh oh oh, we're going to ask you about this,'" recalled Plait. "Over the course of a few days, they were on the phone with me and a lotof other people who knew about, for example, the properties of the lunarsurface, to try to figure out not just the best way of debunking the moon hoaxbut the best aspects of it... so they wanted to know which ones that they hadfound were the ones that I ran into and what were the best ways to tackle them.It was actually a lot of fun." Ultimately, Hyneman, Savage and the others settled on three major areas of thehoax: how light interacted with the lunar surface, how the astronauts appearedto move in the low gravity of the Moon and how items behaved in the airlessvoid of space. Continuereading on collectSPACE.com about how the Mythbusterstested the moon landing hoax claims. 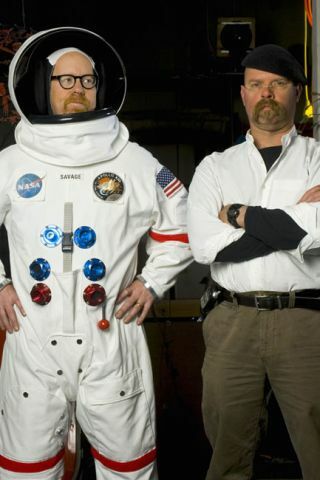 The Mythbusters'NASA Moon Landing Hoax' episode debuts August 27 at 9:00 p.m. ET/PT on theDiscovery Channel. Check local listings. Copyright 2008 collectSPACE.com. All rights reserved.